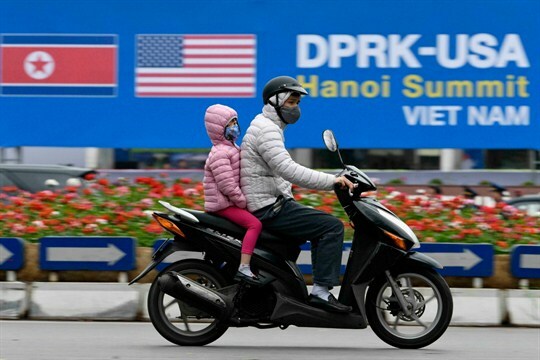 Traffic in Hanoi passes in front of a signboard announcing the upcoming summit between U.S. President Donald Trump and North Korean leader Kim Jong Un in Hanoi, Vietnam, Feb. 23, 2019 (Kyodo photo via AP Images). Final preparations are underway in Hanoi, Vietnam, for this week’s summit meeting between President Donald Trump and North Korean leader Kim Jong Un. U.S. officials hope that in addition to providing a venue and facilitating logistics, their Vietnamese hosts will offer a dose of potent symbolism. Near the end of the Cold War, Vietnam, like North Korea today, was an authoritarian one-party state with a military-driven command economy, diplomatically isolated and struggling to feed its population. Since introducing market-oriented reforms in the late 1980s, it has grown into a regional economic powerhouse while maintaining its closed political system. It also enjoys increasingly close ties with its erstwhile nemesis, the United States.